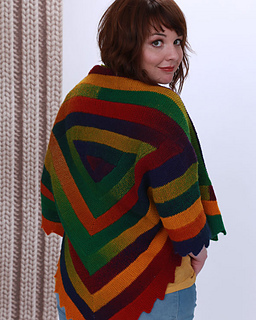 Statistically speaking, knitters today love two types of projects more than all the others: shawls and cardigans. This ingenious piece, from the clever minds at Schoppel, combines the best elements of both in a garment that showcases the brilliance of their self-striping Zauberball 100. Knit modularly from the center out, there are no seams to slow your knitting pace. Short row shaping emphasizes the slow color changes and a simple sawtooth edge serves as a bold frame. Leave the garment as is, or sew armholes to wear this shawl as a cardigan with a cozy shawl collar. This pattern is from our Fall 2014 Magalog, which can be acquired in hard copy by request from your LYS for a limited time, or can be viewed on our website through the link above.